We worship in strange and disjointed ways. One seeking to better understand how Spectra’s blessings arrive and leave our planet is confronted with a bewildering array of graphics. This one shows incoming light in nanometers. This one shows outgoing in inverse centimeters. 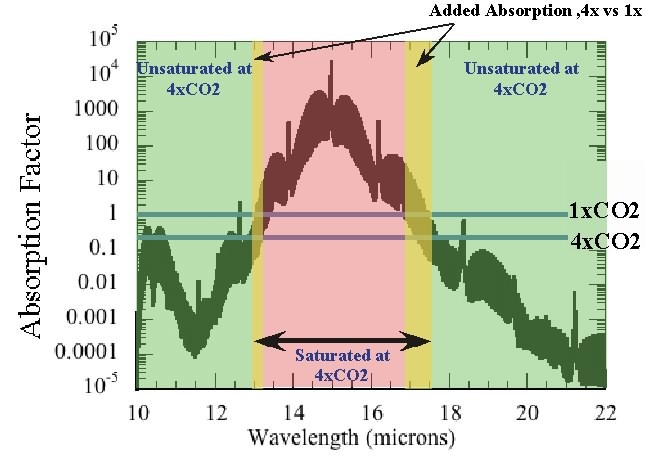 This one shows the saturation of outgoing CO2 bands in microns. A fine kettle of fish. It reflects poorly the clarity of those paid to understand the Goddess when not a single unit matches anywhere and the inverted wavenumbers read backwards relative to microns and nanometers. First, we clarify what CO2 saturation looks like in the parallel universe of inverted centimeters. According to the Beer-Lambert law fluorescent response to a constant light source decreases approximately logarithmically with increased concentration of gas until saturation is reached and increases in the gas have no more effect. 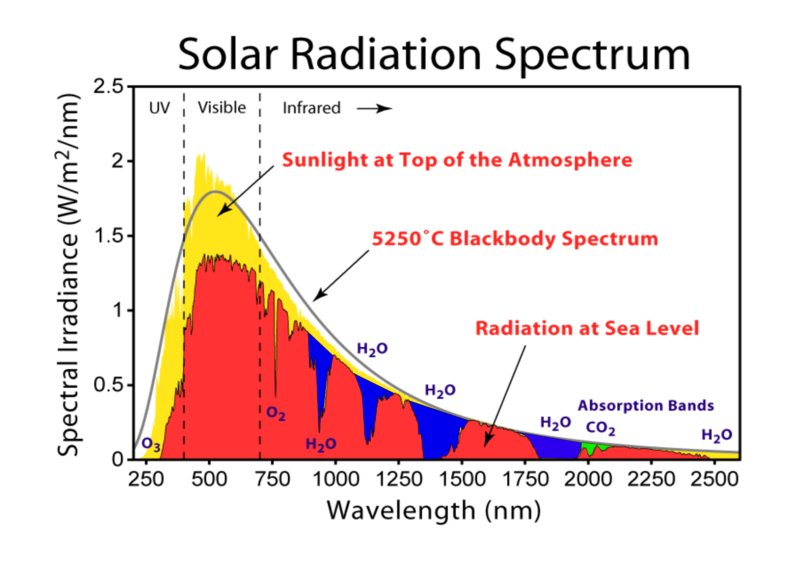 We have plotted Gavin Schmidt’s saturation bands. Boy, if anyone had bothered to do this before, what reason would there ever have been to worry? Finally, we normalize all the discordant units into the big picture as our offering. 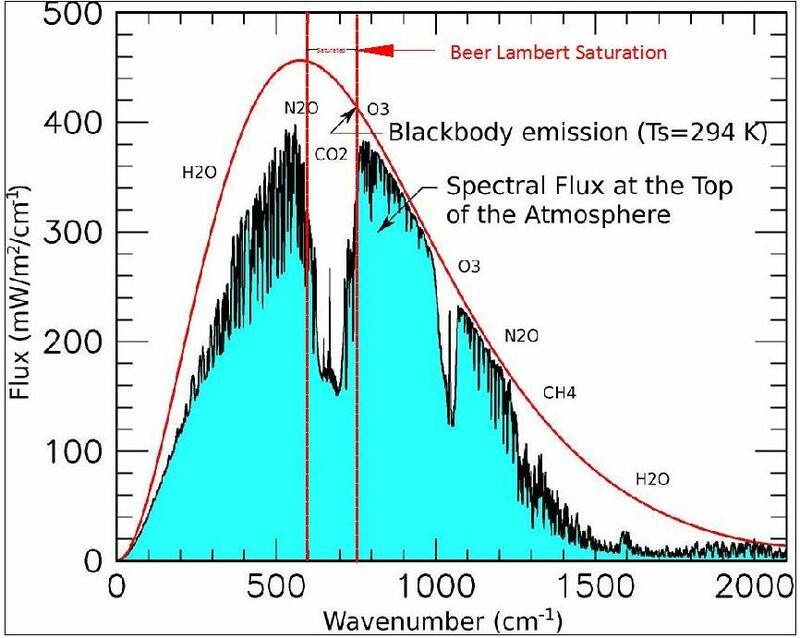 This entry was posted in Climate, Greenhouse Spectra, Optical Material Properties, Photon, Spectra and tagged Beer-Lambert, Clarity and discordant units, Normalized spectra, Saturated CO2 Bands. Bookmark the permalink.